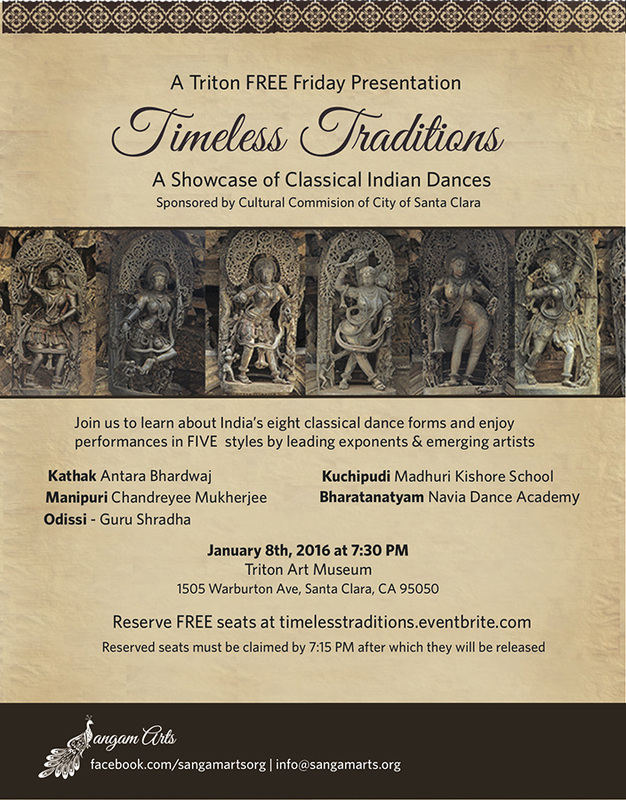 Sangam Arts and the Cultural Commission of the City of Santa Clara are presenting a program of five types of classical Indian dance at the Triton Museum, 1505 Warburton, 7:30 p.m., January 8, 2016. 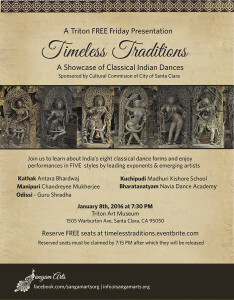 This is a wonderful opportunity to see the beauty and variety of Indian cultures as embodied in the dances. If you have seen or studied Kathak, for example, here is your opportunity to enjoy Kuchipudi. Already know about Bharatanatyam? Come watch Manipuri! Admission is FREE to see outstanding exponents of these powerful and beautiful dances. The artists and their arts are Antara Bhardwaj, Kathak; Chandreyee Mukherjee, Manipuri; Guru Shradha, Odissi; Madhuri Kishore School, Kuchipudi; Navia Dance Academy, Bharatanatyam. Contact timelesstraditions.eventbrite.com to reserve your tickets. These tickets will go quickly; reserve soon. Congratulations to Sangam Arts for organizing this production. It is a great introduction to Indian classical dances and also an opportunity for those who study or perform one of the art forms to expand their appreciation of other forms. This entry was posted in INTERNATIONAL DANCE FESTIVAL-SILICON VALLEY and tagged Antara Bhardwaj, Bharatanatyam, Chandreyee Mukherjee, Cultural Commission of City of Santa Clara, Guru Shradha, Kathak, Kuchipudi, Madhuri Kishore School, Manipuri, Navia Dance Academy, Odissi, Sangam Arts, Santa Clara, Triton Museum on December 23, 2015 by Leslie.